Continuing San Francisco’s history of artist-run spaces, this month we highlight a few of the newer home/apartment galleries. Then don’t miss two opportunities to buy art while supporting long standing arts organizations. Truesilver Gallery, 4391 24th Street is a new space started by husband and wife, Charles and Heather Holt Villyard. 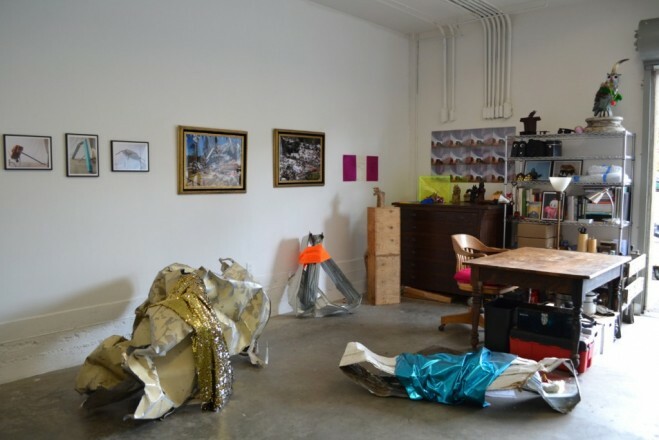 The goal of Truesilver Gallery is to provide new opportunities and audiences for emerging artists while engaging the residents of Noe Valley in contemporary art. They open their home as an exhibition and project space for artists working in painting, sculpture, photography, performance and new media. Currently on view until July 10th is Fresh Paint, New Work by Leah Rosenberg. Leah Rosenberg's installation Fresh Paint. 31 Rausch Street is contained in the hallway of artist Chris McCaw’s apartment that’s been home to 40 art shows since 2005. Nothing is priced over $200 and the artists take 100% of any sales. This makes the art financially accessible to the artist’s peers, encouraging them to start collecting real works of art. The pricing also motivates the artists to make new, usually experimental work. Visit the 21 Rausch Street website for the next opening reception. 2nd Floor Projects, 3740 25th Street is run by artist/curator Margaret Tedesco, a longtime resident of San Francisco known for her curatorial eye and commitment to local artists and writers. 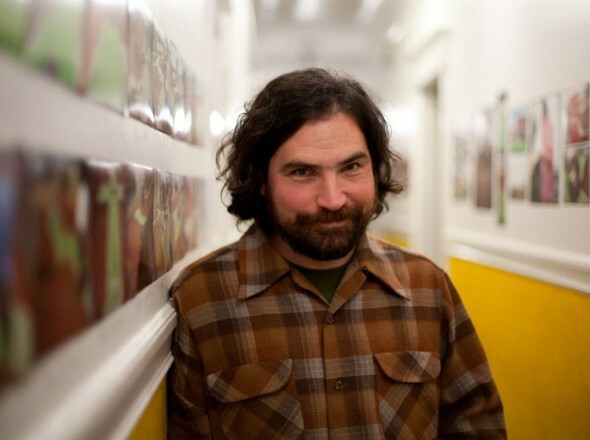 After working for seven years programming performance and visual art programs at the now-closed New Langton Arts, Tedesco founded 2nd floor projects in 2007. 2nd Floor Projects is open Sundays 12-5pm, Wednesdays 3-8pm, and by appointment. Currently on view until June 6th is Arnold J. Kemp: How to Make Mirrors with Robert Gluck: My Last Day. An Essay. Unspeakable Projects, 735 Tehama Street represents newly emerging artists working in video, installation, painting, drawing and performance. When Mauri Skinfill and her husband Justin Kerr renovated their SOMA home, they decided to use the first floor as a dual kitchen and gallery space. Currently on view until June 7th is Occult Land: Glamour Terroir by Elizabeth Dorbad. Gallery hours are Thursdays 6 – 8 pm, Saturdays 1 – 4pm and readily by appointment. Wednesday, June 6th, 6:30pm, Headlands Center for the Arts Auction, Herbst International Exhibition Hall, 385 Moraga Avenue in the Presidio: Headlands Center for the Arts is a multidisciplinary, international arts center dedicated to supporting artists; the creative process; and the development of new, innovative ideas and artwork. Nearly 100 artists have donated pieces and created Headland’s inspired objects in honor of their 30th Anniversary. This event will take place off-site in the Presidio. 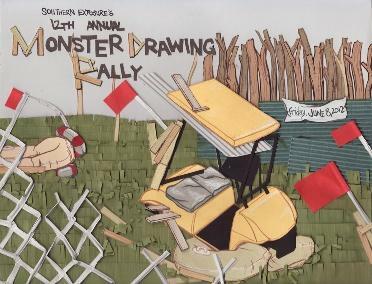 Friday June 8th, 6 – 11 pm, Southern Exposure’s Monster Drawing Rally, The Verdi Club 2424 Mariposa Street: Demystifying a process that usually takes place in the privacy of the studio, the Monster Drawing Rally allows spectators to observe artists in the act of creation in the public domain. This fun, and very popular, fundraiser allows attendees to watch the creative process unfold, and then purchase a drawing for $60.